I held on to the fantasy with a grip so tight nothing would separate us. My marriage may have been over but at least I had my home, which, in truth, was really the garden. My garden – that postage-stamp-sized patch that I’d cultivated into an urban oasis – was the true heart of my home. Mornings began with a look at the garden space. From a second-floor window in the reading nook, I observed the seasons as they played out below. 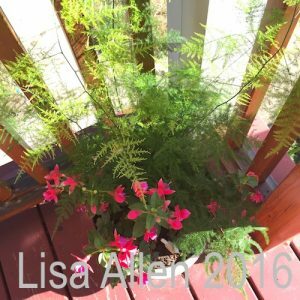 An empty nester, I’d turned to nurturing the soil as if it were a baby in need of my care. The Blueberry Muffin (Viburnum dentatum ‘Christom) and Fragrant Abelia (Abelia mosanensis) shrubs had grown into dense green fencing. Perennials, once the rare accent here and there amongst annuals, had been lovingly collected over the years and now dominated the beds. And the Mandarin Azalea bloomed by the back door each spring, her robust orange blossoms celebrating another successful winter’s rest. I’d planted Rosa rugosa and hydrangea along the front of the house, reminders of evening walks with my mother and her dog on Nantucket Island. Come each May, this was my outdoor living room. I will hold on to this in the face of losing all else that represents stability to me, I thought. However, the financial reality was soon unavoidable: the house would have to be sold. The definition of home was up for grabs. Without a garden to tend would I be home-less? 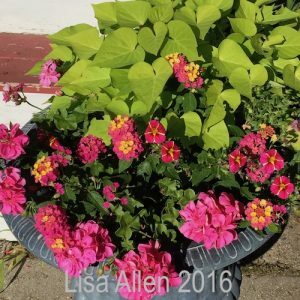 Could container gardening successfully replace in-ground beds? I didn’t have an answer to these questions, but I did know that I could not entrust the care of my pampered greenspace to an anonymous house buyer. My plants were up for adoption! I traded plants for hairdressing services and eventually gave away every ornamental rose bush and perennial, from the clematis to my beloved peonies. There’s something satisfying about sharing plants – it feels like a good deed. Joy sprinkling, I call it. I had discovered a sweet side of leaving home. Shortly after relocating I found a small local nursery (I almost never buy plants at big box stores). Filling one garden urn and a second porch pot proved to be just right for me this year. Could I call these container gardens home with the same heartfelt passion as the old place? No. But they certainly made the porch feel like it was mine, an important horticultural extension of this new life chapter.